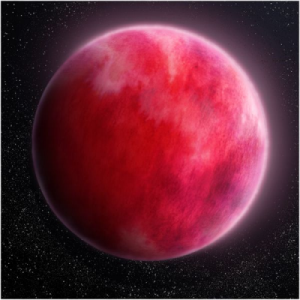 The Keyframer is doubtlessly one of the most used effects in TVPaint Animation. It is found in the Effect > Motion main menu. It is used to move all kinds of drawings on the screen. * The path taken by the object on the screen using animation keys or pre-defined paths. * The rotations to be applied to this object using keys. * The motion blurs and, if required, pre- and post-behavior. 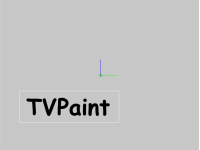 To start our study of the Keyframer, we have created a «TVPaint» brush (320*100 pixels) as shown opposite. 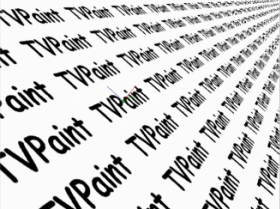 The word TVPaint is written in black on a transparent background. In some of the images hereafter, the background chosen is gray so that you can see the white pixels of the HUD. 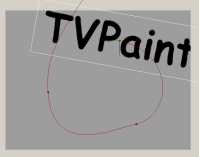 We will now move the "TVPaint" brush on the screen. * Go to the Source tab and select the custom brush as source. * Go back to the Position tab. 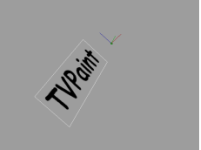 * Place the TVPaint brush outside the current project to the left using the HUD and then create an animation key for the position variable at the beginning of the layer. 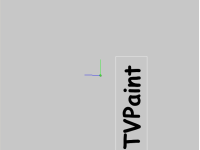 * Now create an animation key for the Position variable at the end of the layer and place the TVPaint brush outside the current project as before but this time to the right. * As needed, you may adjust the position of the movement key points using the numeric fields and mini-sliders (use the values shown opposite). 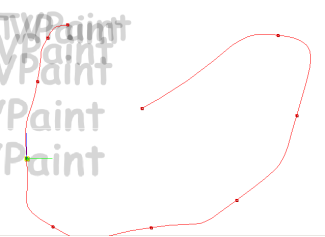 The X and Y fields represent the position of the brush center on the screen. Playing your project in Preview mode allows you to check that your brush appears on the left of the screen and disappears to the right. 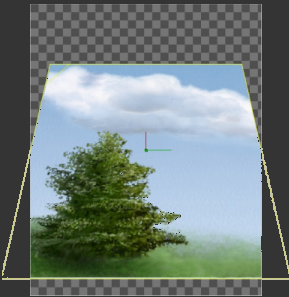 To create a path you may position a brush outside the project area: the brush then appears hidden and only its outline is visible as HUD (see above). Do not immediately apply the FX stack. Did you notice the Z position numeric field? 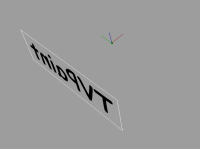 This is used to set the depth of the object moved on the screen. A positive value in the Z numeric field would have resulted in the logo moving away. It is possible to generate even more subtle movements as our logo may follow the pre-defined path of our choice thanks to the Path Recorder or Pixel Tracker. 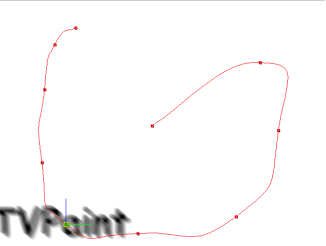 You may also curve the paths thanks to the HUD and the keys of your choice (Linear, Spline or Smooth). 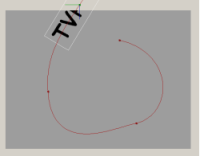 For example, in the trajectory below, the logo follows a spline on the screen while zooming lightly towards the foreground. Now we will make it a bit more complicated... It is possible to leave a trail behind our logo, a trail that depends on its speed and trajectory. The Blur step value defines the number of logos which will make up the "trail". 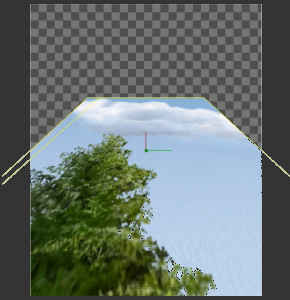 The Blur Size is used to set the parameters of the trail length (see opposite). 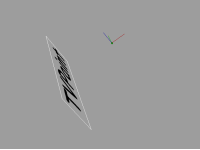 Note that low Size value generates a slight blur in the movement direction which is ideal for creating blurs generated by fast object movement. A zero value will eliminate the trail. The settings of the progress profile (lesson 12) come into their own here: the movement is accelerated or slowed at your discretion ! A few words about the AntiAliasing popup. 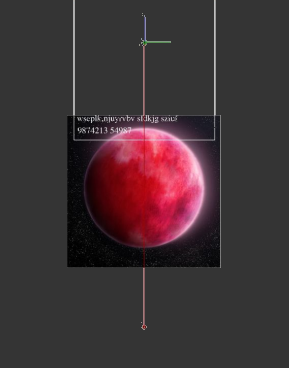 This option can smooth the border of the image when it is applied on the project. 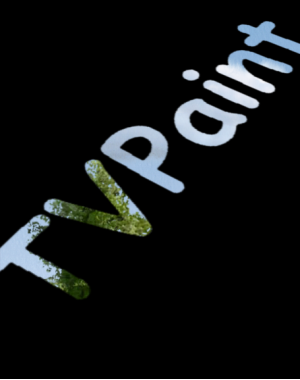 In this second example, we will pivot our "TVPaint" logo using the pitch, heading and bank parameters. 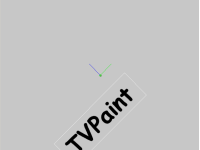 Reset the values of the Keyframer effect to zero, select the "TVPaint" logo as source again and modify the Bank angle using the slider. The logo then turns along the blue axis represented on the diagram (see below). Reset the values of the Keyframer effect to zero and proceed in the same way with the Pitch parameter. The logo now turns along the green axis represented in the diagram. 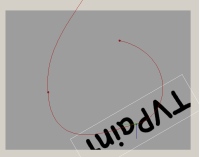 With the Heading parameter, the logo turns along the red axis represented in the diagram. The combination of these three parameters gives a wide variety of results. It is now up to you to use these rotations in your animations and videos. 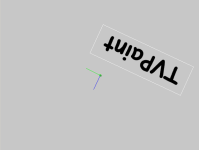 The logo may carry out several rotations around an axis: you simply modify the value of the Rotation parameter when creating the animation keys to increase the angle to 360°. In the examples above, our logo always turns in relation to its center: the axes the logo turns around cross each other in its center. 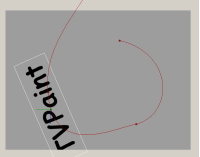 The Pivot parameters may be used to modify the position of the rotation axes in relation to the brush. Modifying the pivot X coordinate by increasing it by 100 pixels and decreasing the Y coordinate by 100 pixels will generate other types of rotation when modifying Pitch, Heading and Bank, as the rotation axes are outside the logo. Below you will see the effects of the Heading modification for our new pivot. Each of the buttons Bank Align., Heading Align., Pitch Align., when enabled, allows modification of the brush angle depending on the path it follows. 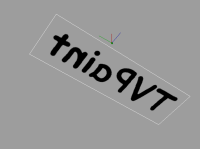 Below: the angle of the Heading parameter varies according to the logo trajectory. * The Fill option is used to fill the screen with the current source. In this case, animating the source will also animate all its copies. * The Opacity parameter is used to adjust logo transparency as time progresses. 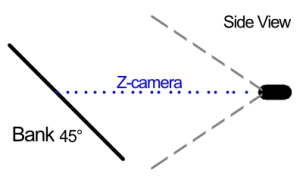 * The Z camera parameter represents the distance between the "virtual camera" and your image in pixels. 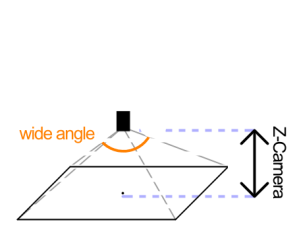 The smaller this distance, the larger the opening angle of our "virtual camera". 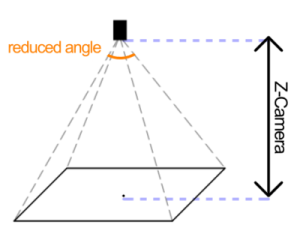 This enables you to use the "wide angle" effect well known in cameras by using the parameters for Pitch and/or Bank. 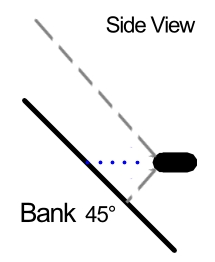 Above, the bank parameter was set to 45° for our merged image of the tree. 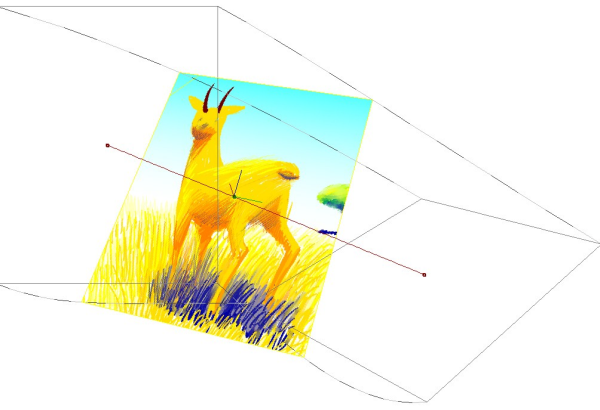 The image at the top was obtained with a Z-Camera equal to 1000, the one below with a value of 210. This third example will allow us to work with different sources (Source tab) in the Keyframer effect. 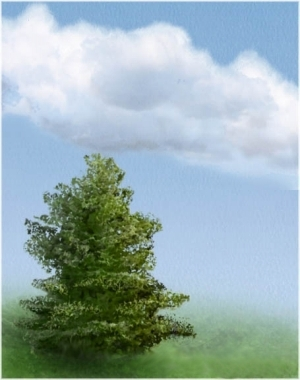 Let's go back to our "planet" image used in previous lessons. We'll assume that your cartoon is finished. Now you want to scroll the list of participants in the form of end credits. We'll assume that this list is contained in another project much "higher" than the one of your planet (opposite). Pay attention that the text is written on a transparent background, then select (Background = None) in the timeline of this second project. 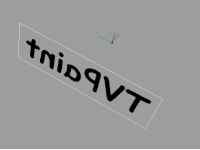 * Place two keys at the beginning and the end of the animation layer with the position parameters close to the illustration below. * Apply the FX stack. It's done ! … The list moves from the bottom to the top as intended. 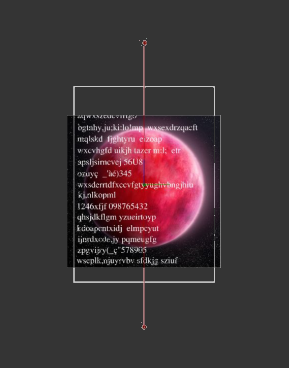 Thanks to the Keyframer anything may be moved on the screen: a brush, another project, the layer of your choice, the spare image, the current image, etc… You simply choose what you want in the Source popup menu of the Source tab. 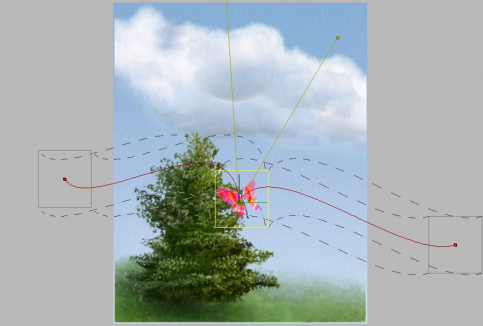 For example, exchange the current brush with the "butterfly" animated brush in the Bin tab. 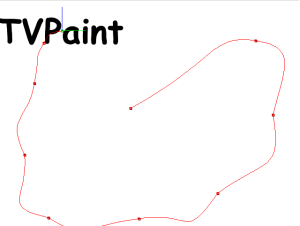 This animated brush may also be moved as you wish and, why not, follow one of your pre-recorded paths. 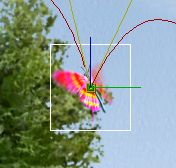 Below, our butterfly lands on the tree before flying off again and leaving the screen. 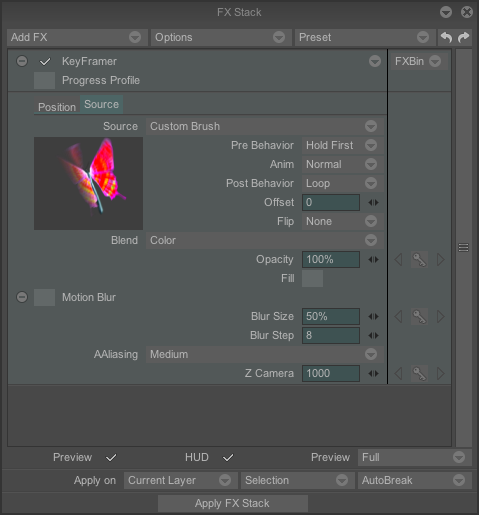 When using animated brushes or animation layers as source images, additional settings will be required. In this case, you have two popup menus at your disposal: Before and After. 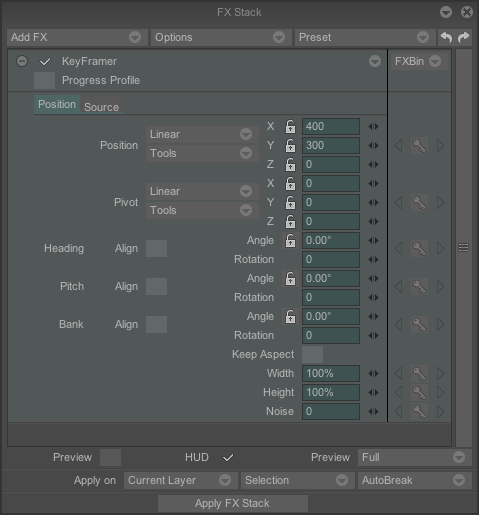 They may be used to define how the images of your animated brush or animation layer would be applied by the Keyframer effect if their number were lower than that of the sequence you are working on (application of the brush or animation layer images with Loop, Pingpong, Random, etc.). For our butterfly we have chosen the Loop mode. This example will help you understand the Blend menu in the Source tab. Load the video footage of your choice and then create an animation layer containing only black and opaque frames just in front. Create any type of movement for the object of your choice using the Keyframer tool. 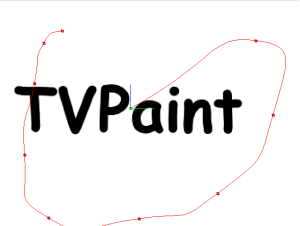 Here, we are taking a red "TVPaint" logo brush. Its trajectory is of no importance. 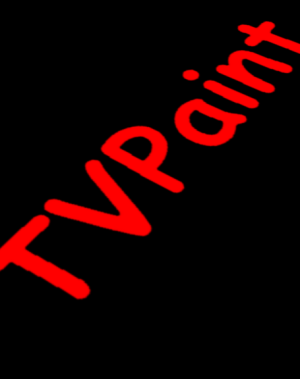 Our red logo will, after application of the FX stack, be placed on each black image. So far, nothing new. 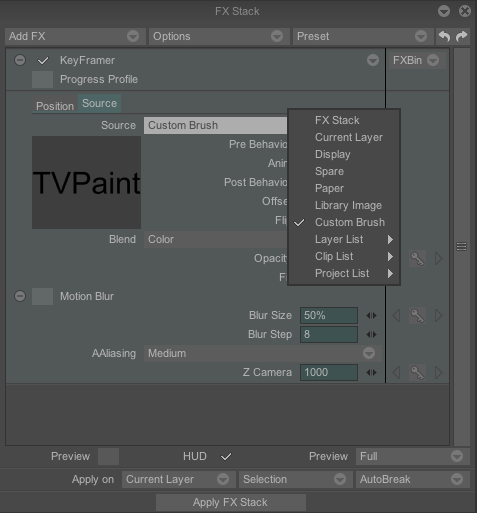 If, before applying the FX stack, you select the Erase mode in the Blend popup menu (Source tab) you obtain the result shown opposite. Our "black" layer was erased at the logo passage areas which made it possible to see the layer underneath. It is as if our logo had been applied with the Eraser color mode.